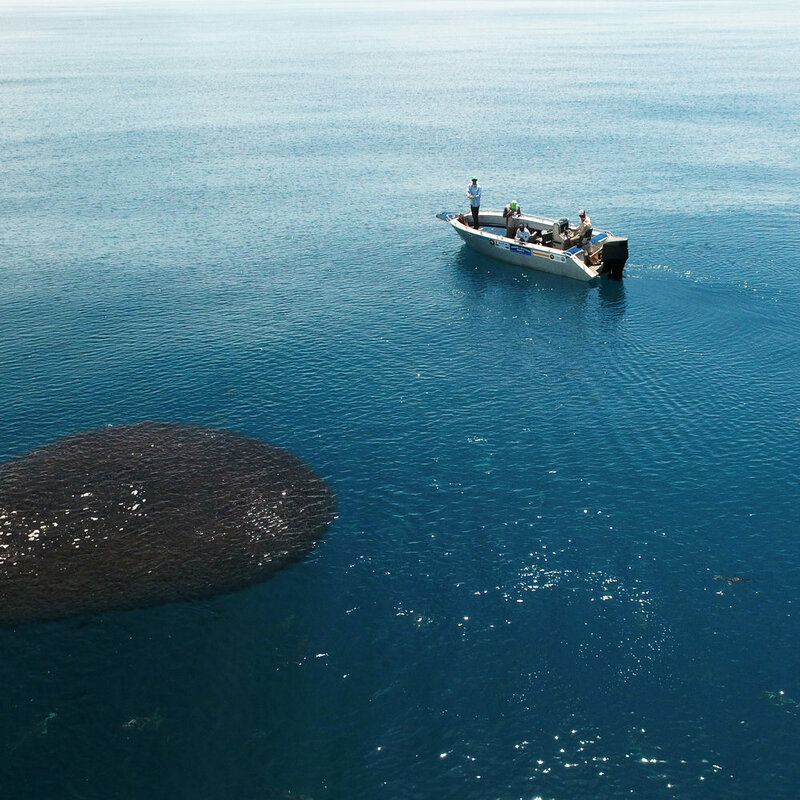 Barramundi are a fish of legend, their reputation as being Australia’s premier light-tackle sporting fish is well earned and there is no better place in Australia to chase barra than the Tiwi Islands. Situated 60 kms to the north of Darwin, Melville and neighbouring Bathurst Island are collectively known as the ‘Tiwi Islands'; the home of the Tiwi people. Known for its tropical climate, its friendly indigenous population and its great fishing, there is very little infrastructure on the Tiwi Islands, and they are not open to the public for tourism, except on organised trips operated by Tiwi Islands Adventures. 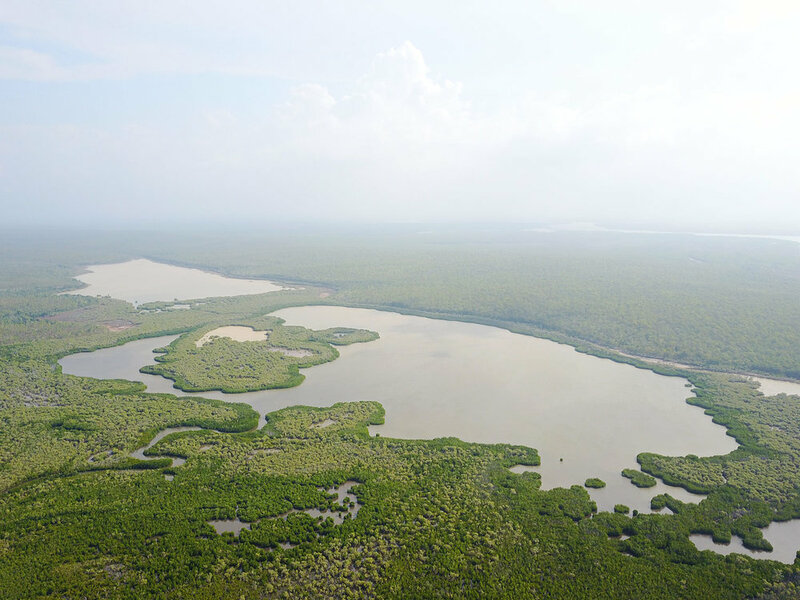 This remote and remarkable area consists of thousands of square kilometers of mangrove lined river and creek systems, sand flats, bays, inlets and coastal reefs, all abundant with marine life. 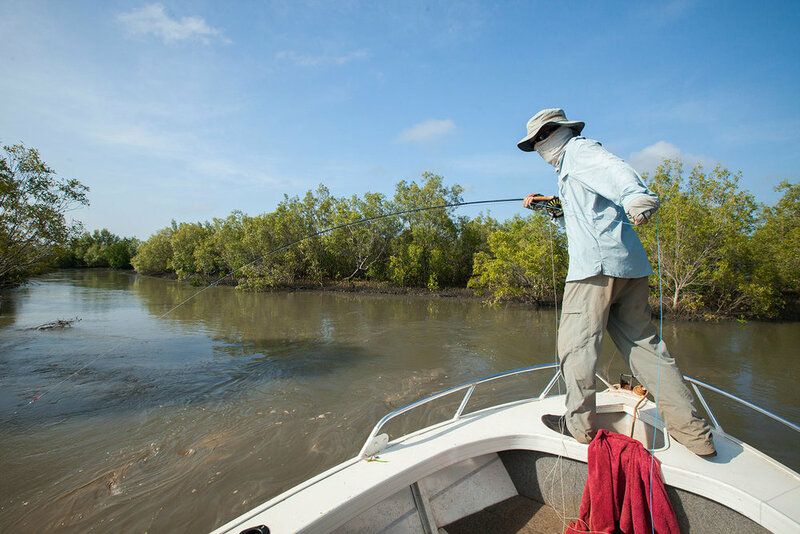 Melville Island Lodge has exclusive access to Goose Creek (Andranangoo in the Tiwi language) a spring creek that abounds in barramundi and saratoga; a fly fishing paradise. LODGING DETAILS: Accommodation and fishing at the Lodge is restricted to a maximum of 18 guests. Getting off the beaten-track doesn’t mean roughing it, the Lodge has 240v power, hot showers, flushing toilets, phone & email access. The main building is the centre of activity at the lodge and houses a spacious, well appointed and comfortable indoor-outdoor dining area, licensed bar and guest lounge. Open to cooling sea breezes, and magnificent 270 degree river and ocean views, the main building is the perfect place to relax after your day’s fishing. Our comfortable and well appointed guest rooms are close by and consist of 6 x single occupancy plus 6 x twin-share cabins. All cabins are air-conditioned with queen and/or king-single beds. Adjacent to the cabins are the guest bathrooms which include a private ladies bathroom and dressing area. FOOD & BEVERAGE: The Camp has its own chef who is dedicated to serving high quality meals. Breakfast is served around 6.45am each morning with the aim of having you on the water and fishing by 7.30am. It includes bacon & eggs, cereals, toast, tea and coffee. Lunch is taken out on the water each day at a shady spot on the river. Dinner is served around 7.00pm and as might be expected, freshly caught fish is always on the menu. LENGTH OF STAY: The typical lodge package at Melville Island Lodge is five (5) days of fishing but a package can be tailor to suit your needs. NON-ANGLING ACTIVITIES: Melville Island Lodge is situated in a very remote part of Australia, and overall, this is a fishing-focused operation. If you are looking for an authentic indigenous community experience, you will be certain to enjoy a visit to nearby Jilamara Arts & Craft Centre, a dip in a local swimming hole or even a visit to the Milikapiti Sports & Social Club. INTERNET/COMMUNICATION: Melville Island Lodge has internet services for guests although the internet speeds reflect its isolation. 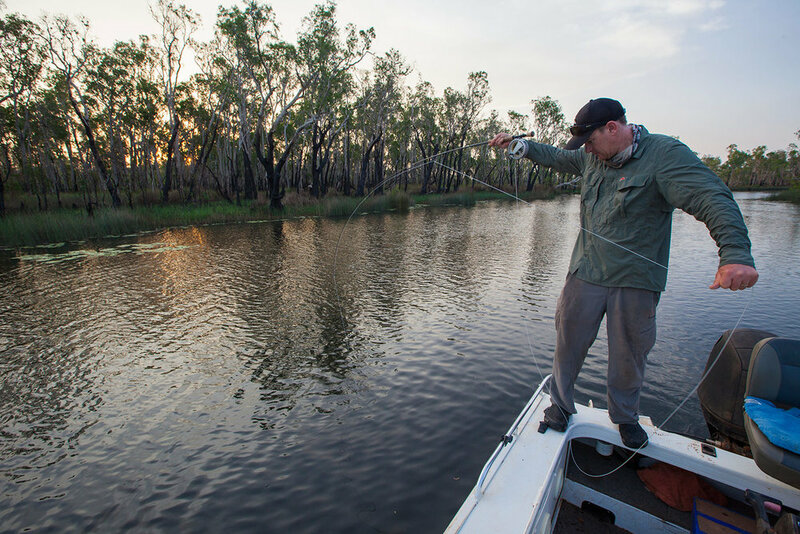 GENERAL INFO: The Melville Island Lodge represents the ultimate Northern Territory outback fly fishing adventure. The Melville Island Lodge operates May-Dec with exclusive fishing access to Snake Bay, Shark Bay, Jessie River, Rungani, Robinson Inlet and Goose Creek plus a vast range of coastal creek and reef fishing options, the fly fishing highlight is the spring creek fishing for saratoga and barramundi. The offshore fishing to busting schools of tuna and mackeral is also a must do for fly fishers. Other species you could encounter include mangrove jacks, threadfin and blue salmon, saratoga, fingermark, tarpon and estuary cod. Plus, off-shore there are spanish mackerel, black jewfish, golden snapper, queenfish, giant trevally, coral trout, long tail tuna and many other species. All-up there is about 40 different species of fish in these waters. BOATS & MOTORS: All boats are custom-built, 6.5m in length and fitted with 150hp four stroke motors. All have colour sounders, GPS, satellite phone, 2 way radio, first aid kit and full safety equipment. All have carpeted floors, a spacious forward casting platform, gear lockers and comfortable padded seats. EQUIPMENT REQUIRED: We recommend you bring 9-foot 8-weight/10-weight/12-weight rods. To match the various estuary, inshore and offshore fishing you will experience. A quality fly reel is important. A strong, smooth drag is a must, as larger barramundi are both strong and fast. Reels should have capacity for the fly line and 100 yards of 80-pound backing. Pack weight-forward tropical floating fly-lines (redfish, tarpon, and bonefish lines works well). Also consider “over-lining” your rods. For example, we often use a 8-weight floating line on an 7-weight rod, which has dual benefits: 1) It makes it easier to load the rod with less line and 2) the heavier line makes casting larger flies easier. Additionally, we recommend bringing a fast-sinking line such as Rio’s Leviathan (or similar), which has a 26-foot, 300- to 350-grain sinking tip. Intermediate tip lines are good options, too, including RIO’s General Purpose Tropical F/I. Note: DO NOT bring conventional cold-water floating lines. The tropical weather makes them soft and gummy and therefore difficult to cast. Leaders should be heavy enough to turn over big flies. Spools of mono should include 15, 20, 30, 40, 80 lbs, test weights. For floating lines you should have 9 foot long tapered leaders. Some fish, such as mackeral, have very sharp teeth that will cut even the strongest mono. Bring plenty of 20 to 40 lb test steel leader for your stay. Guests fly into Darwin and typically overnight there having spent a day touring this wonderful city. ARRIVAL & DEPARTURE DETAILS: From Darwin you will be transported to the islands by light aircraft, a scenic 30 minute private charter flight. Lodge staff will meet the plane and transfer guest and their luggage to the lodge. WHAT'S INCLUDED: Return 30 minute private charter flights ex Darwin, All Tiwi Island transfers between the airport and lodges, Tiwi Island visitor and fishing permits, Professionally guided fishing in custom-built 6.5m boats, Comfortable air-conditioned accommodation, All meals & non alcoholic refreshments & Goods & Services Tax. WHAT'S NOT INCLUDED: Alcoholic beverages, gratuities for guides and house staff, airfare to Darwin.